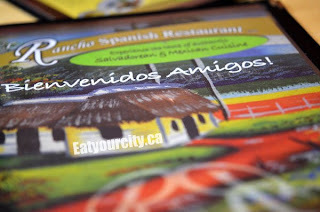 Eat Your City: El Rancho Spanish Restaurant Edmonton, AB - Salvadoran and Mexican cuisine.. amazing homestyle pupusas, tacos, enchiladas, fresh tortillas and easy on the wallet! Its not often we bumble our way across a hidden gem, and we're very glad we found this one! Set just off 118 Ave, its little eateries like this that draw people in after dark to stroll and visit the various eateries. With a clean, modern front, its a warm bustle of activity inside despite us arriving pretty close to the kitchen closing time. Little crafts and art pieces enliven the warm amber color scheme and light wood tables. We had a neat little birds nest cage complete with a fake birdie close to our table. Service was efficient, friendly and knowledgeable. Though she was busy, the waitress made time to bring an extra chair to a guest next to us who needed it to elevate his casted leg, and didn't leave until he was comfortable. Being tantalized by a myriad of tasty scents wafting from the kitchen, we grilled our waitress about menu items, ordered a Salvadoran and Mexican feast, and we weren't disappointed. We rarely give a rating this high for both service and food, but its well deserved as this unpretentious family owned restaurant knows their food and showcases dishes and flavors that would grace their table at home. With most appetizers having the ability to transform into an entree if you order more, we threw caution to the wind and ordered waaay too much food... and it wasn't for the lack of trying! We had lots of tasty leftovers for lunch the next day. All items can be made with chicken, beef, pork or tofu for the vegetables-inclined. We started off with their infamous Pupusas - the picture just doesn't do it justice. The slight sweetness of these simple looking, freshly made ultra tender and fluffy corn tortillas add to the hidden secret they have inside - lightly spicy and creamy refried beans, chicaron (seasoned pork ground into a smooth pâté) and molten mozzarella cheese make these pupusas incredible. 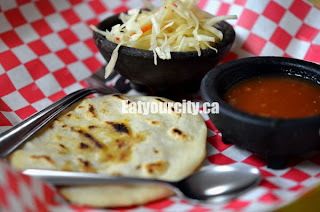 Served with a side of tangy and crisp pickled cabbage salad and homemade tomato sauce rich with pureed fresh tomatoes and a hit of spice that you pile on top of your pupusa... wow. I think we all had looks of pupusas heaven on our faces as we bit into these pupusas. YUM!!! I can eat these all day until I'm as big as a house. They are not to be passed up. Make sure you order lots... people will not want to share. Nom! This appetizer dish for two can easily serve as an entree for one hungry guest as it comes with two Flautas Mexicanas, two tacos and two Enchiladas Salvadorenas. 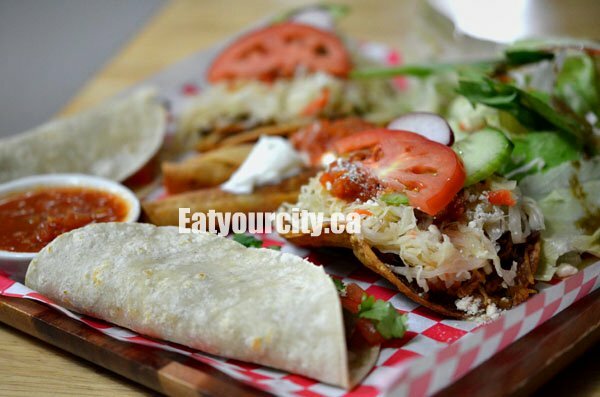 The Flautas Mexicanas were small tortillas rolled with seasoned shredded chicken, onions and carrot bits fried to a golden crisp, and topped with sour creme and their homemade tomato sauce. Tasty, though oddly, they were served cold. Maybe it was the end of the night. They would be wicked served piping hot. (They're the ones that look like blurry spring rolls in the center of the pic) The Tacos fared much better and were packed with flavor from the seasoned moist beef, cilantro, diced onions and that ridiculously tasty homemade tomato salsa, all folded up in a soft fresh flour tortilla. Mmm.. simple and delicious! the Enchiladas Salvadorenas were unforgettable as they were the favorite of the night. Crisp, fried (and non-greasy!) tortillas are topped with a mountain of flavor - seasoned moist chicken, spicy refried beans, tangy addictively-good pickled cabbage, homemade salsa, ripe tomato slice, a crisp sliver of cucumber and a sprinkle of salty Parmesan. The savory, creamy, crunchy and tangy elements combine to make this one of the best Salvadoran tacos I've had in a long time. Since its a family run restaurant, there is a large pile of crisp mixed lettuce laced with a homemade herbed dressing so you get your veggies too (Thanks mom!). They forgot the guacamole (an extra), but its so good, we forgave them and vow to try them with guacamole next time... you just can't get enough of these. Nomnomnom! The Enchiladas Mexicana were soft fresh corn tortillas encasing shredded moist seasoned chicken, and smothered in a velvety blanket of slightly smokey spicy mole sauce (smoked ancho peppers maybe? ), before being crowned with sour creme and their delectable homemade tomato sauce. 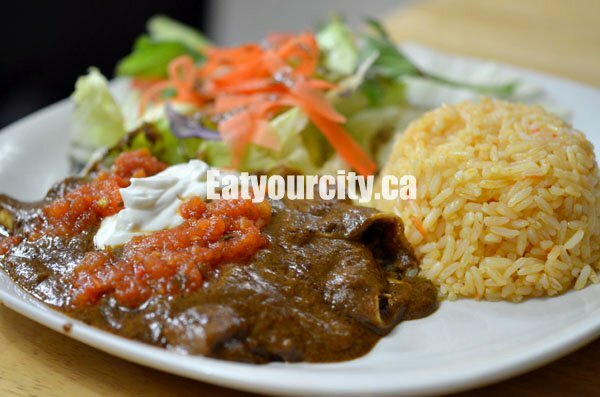 The mole sauce is flavorful and reminds me of some of the better mole sauces I've had while travelling around Mexico years ago. Its so easy to forget about it and leave it bland... I'm glad El Rancho takes the time to make this a subtle yet complex and tasty sauce! 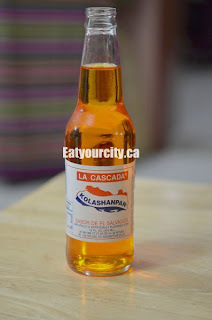 Its great alone or with the rice that's aromatic with sweet notes of tomatoes throughout. And yup, it comes with their house dressed salad so we get our veggies in tonight! We ran out of room to try their desserts - amongst them, a fried ice cream - which the table beside us cheerfully teased us about as they dug into their dessert. Dessert is also going on the list of items we'll try the next time we're back. Phew.. so much tasty food, I think we're gonna food coma at the table LOL! Hands down the best Spanish / Mexican / Salvadoran cuisine in the city and truly a hidden culinary gem you would be amiss to pass up on. 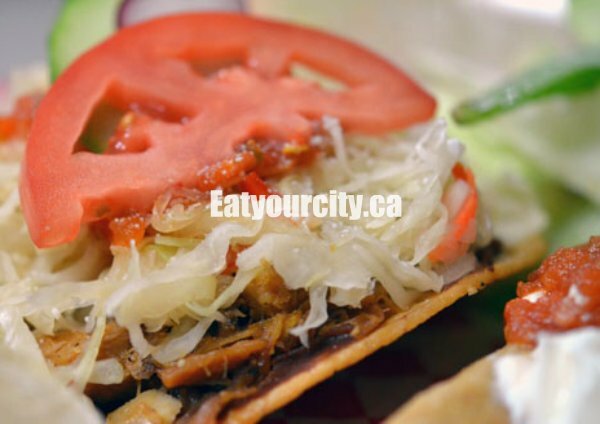 Bring your family and friends for exemplary service with deliciously simple and complex dishes that would be proud to grace any Mexican or Salvadoran table, without emptying out the piggy bank. The owners and chefs - a mom and daughter powerhouse team make sure this restaurant is warm, inviting and every dish is packed with flavors to savor. 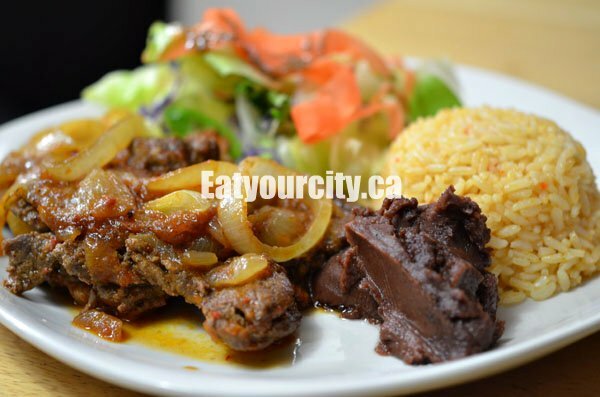 They're also super friendly, passionate about their cuisine (and food in general) and will make time to chat with customers about the meal, the community, reminisce about traditional dishes from home, or traditional dishes they may bring back as a special. We'll be back and looking forward to the day they bring back the cow tongue special! Just make sure you call ahead for reservations as they're busy (sometimes they take holidays and close up for a week or two for quality family time). So go, eat, and you won't be disappointed! La comida estuvo deliciosa! Hours Tues-Sat for lunch and dinner Hours vary, so call for reservations!